The UIM Marathon C class at the Cowes Classic is going to be hotly contested this year. Two of the contender’s in class have already started to ‘ramp up’ their rivalry. 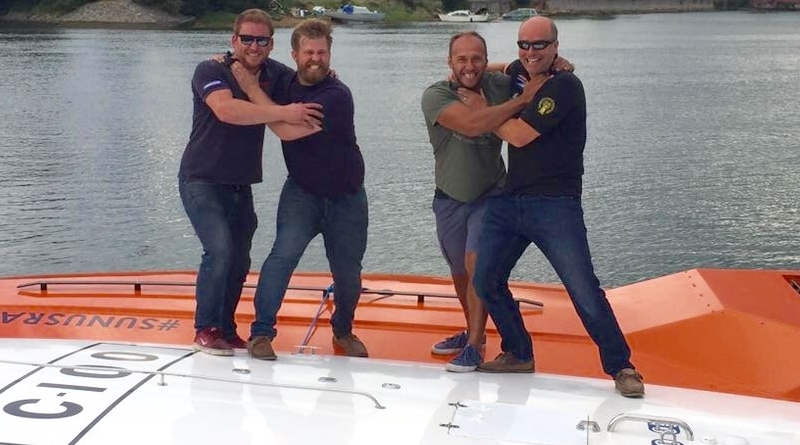 Michał Galczewski, the Polish builder and Navigator of the Spectre 32R, SUNUS Ocean Racing towed the boat to England for further testing last week. British driver Tom Montgomery-Swan thought it would be an ideal time to test in the Solent against one of their rivals, BlastOff Racing, driven by Dorian Griffith and crewed by Will Stevens, a Sales Engineer for E.P. Barrus. We are running a Yanmar diesel powered Fountain hull against SUNUS’ Mercury 4-Stroke Outboard set-up, it would appear that we are fairly equally matched after the test runs. Once we had finished on the water, we choreographed a ‘mock fight’ between the teams for a publicity photograph, I chose to spar with Will. Dorian is old enough to be my grandfather and that would have been unfair!